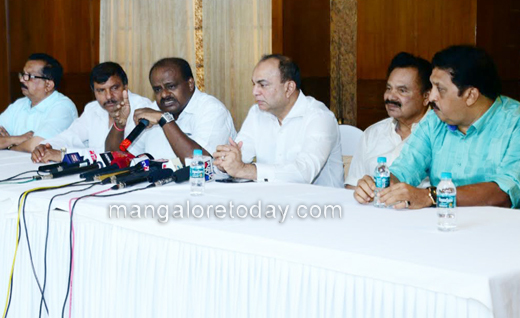 Mangaluru, April 18, 2017 : JD(S) State President and former chief minister H D Kumaraswamy has rubbished rumours of his party entering into an understanding with the Congress to fight the next assembly elections. 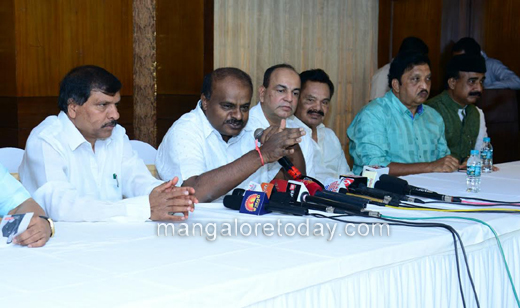 Speaking to reporters here on April 17, Monday, Kumaraswamy said the JD(S) was not working towards entering into an alliance with any party. Stating that the party already had a bad experience after running a coalition government with the BJP in the past, he made it clear that the JD(S) would not forge an electoral alliance with any party. On the Gundlupete and Nanjanagud by polls, Kumaraswamy alleged that huge money has been distributed among voters to lure them. He also predicted that at least three Congress leaders may join the JD(S) before the next elections. Commenting on the statement made by former Jammu and Kashmir CM Omar Abdullah comparing his father Deve Gowda with former Pakistan military ruler Musharaff, Kumaraswamy said Abdulla would have never made such a comment had he been aware of the efforts made towards the development of J&K during the prime ministership of Gowda.